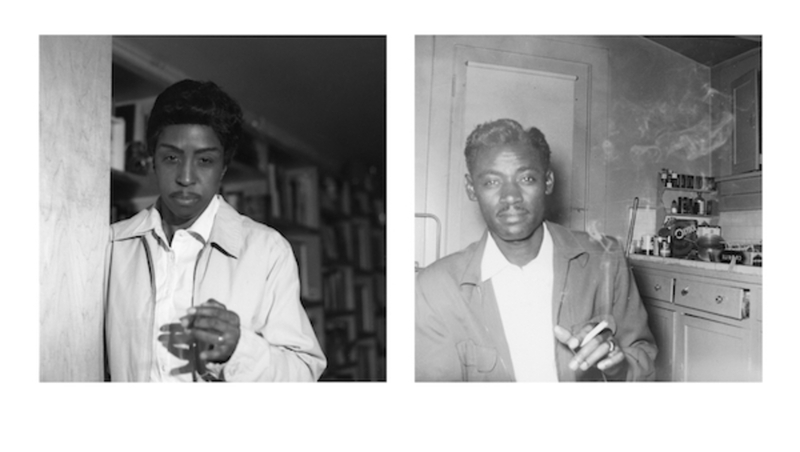 Lorna Simpson, 1957-2009 (Detail/Comparison), 2009, gelatin silver prints, each 7 x 7", overall dimensions variable. Photo: James Wang. Lorna Simpson, best-known for her body of conceptual photography, has recently been exploring painting. On the occasion of her solo exhibition at the Modern Art Museum of Fort Worth, which runs through January 15, 2017, she reflects here on her experience of this medium, and how it relates to her practice of imagemaking in general. I APPROACHED PAINTING initially from a place of intimidation. I started my undergraduate studies as a painter, as perhaps all foundation studio students do, and yet when I proposed a series of paintings for the first time, for the Fifty-Sixth Venice Biennale in 2015, the response from the curators wasn’t immediately “Oh, definitely!” I had been thinking for a couple of years about how I might begin to explore this different way of making work. I could have picked my timing to start showing them in a less intensely scrutinized exhibit, but then again, I like the challenge of being uncomfortable, inquisitive, and a little nervous, but not fearful. Over the past five to seven years I have had a deep obsession with collage, and the collages have operated as a parallel to the paintings. At times I feel compelled to make paintings with appropriated images, taken from Ebony magazine’s pages, or bits and pieces from AP news photos—a volcano erupting, or a picture of a dam, or ice that has fallen on branches of a tree, and so on. My current exhibition, “Focus,” at the Modern Art Museum of Fort Worth, embraces these themes. The bridge between the early work from the late 1980s and 1990s is conceptual—a consideration of the viewer, how the viewer looks at photography, and upending expectations. I came to painting through a large series of works called “1957-2009 Interiors,” 2009, which were based on found photographs of a black woman. She is in a suburban living room in California around 1957. My assumption is that she is posing in order to create a portfolio for an acting or modeling career, and I reenact her postures. In most of my earlier work I do not appear in the photographs, but in this body of work, I sometimes do. I wanted to challenge the idea of subjectivity, how we come to know the subject, and our desire to get to know the subject through details. My mimicry visibly expanded her project as well as challenged my own. I imitate and mirror her poses and expressions, and in the same manner I also imitate the man that appears in the images. Using appropriated images engages my past work and also engages the appropriation of desire, in terms of the legacies of portraiture, and also of visual information. The discomfort I had about appearing in that body of work is similar to how I felt operating outside of the language of my earlier work. The advent of my career was supported not by institutional photography departments, but by painting and sculpture departments. I had difficulty navigating the photography world, because it didn’t seem to affirm what I did or the context of the work that I was making. And I was told that what I was doing didn’t apply, so I said, “That’s OK, that’s fine, it doesn’t need to.” As a young woman, and a young black artist, I felt like I had the freedom to do whatever I wanted, because I didn’t quite have the assurance of success, but I had a strong desire to create as many of my personal friends who were artists, writers, curators, and filmmakers did. The assumption that I think everyone operated under was that we were not waiting on acceptance but made conscious decisions about bringing to fruition in an uncompromising fashion the work we were inspired to make. That is a commentary on the value of images, imagemaking, and the temperature of the time we live in.